You’re driving along and you notice your oil light come on. You’re on your way to work and you don’t want to be late, but you wonder what you should do and how serious the situation is. 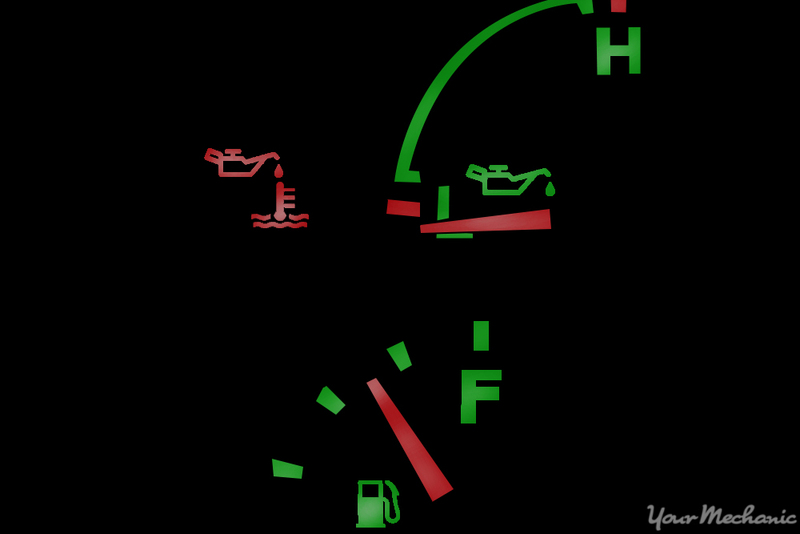 Many modern vehicles have two lights on the dash related to the oil system. The first is an indicator that it’s time to change the oil. This light is designed to come on whenever it’s been a certain length of time since the oil has been changed or when you’ve driven a certain number of miles. The second oil light has been used in vehicles for a long time, and requires serious attention. It indicates you have a low oil pressure level. When your vehicle runs out of oil pressure, it can cause extensive damage to the engine. The light may have an image of an oil can or the word OIL. By following the information listed here, you can prevent a major expense and protect your car. You should take this light seriously and stop your car as quickly as possible. Step 1: Park your vehicle safely. Find a parking lot or other designated area where you can drive your car. If you’re on the highway, you can pull off to the shoulder and turn on your hazard lights. Step 2: Shut off the engine. This will allow you to check your oil safely. Step 3: Open up the hood and locate the oil dipstick. It’s often a bright yellow handle that you pull straight out or it will have the word OIL or an oil can on the handle. Step 4: Remove dipstick. Pull out the dipstick and wipe it off with a clean cloth. Step 5: Reinsert dipstick. Reinsert the dipstick all of the way and pull it out again. Step 6: Determine oil level. Check the reading to see where the oil level is. Step 7: Add oil if needed. Add oil if the level is below the line where it says to add oil or indicates a low oil level. Once you have checked your oil, you must make a decision whether to drive your car or call for help. In certain conditions, your car may be safe for you to drive until you can have a mechanic look at it. If the engine is making noises when it is running, then it is not okay to drive and you should call for help. Step 1: Check for noises. 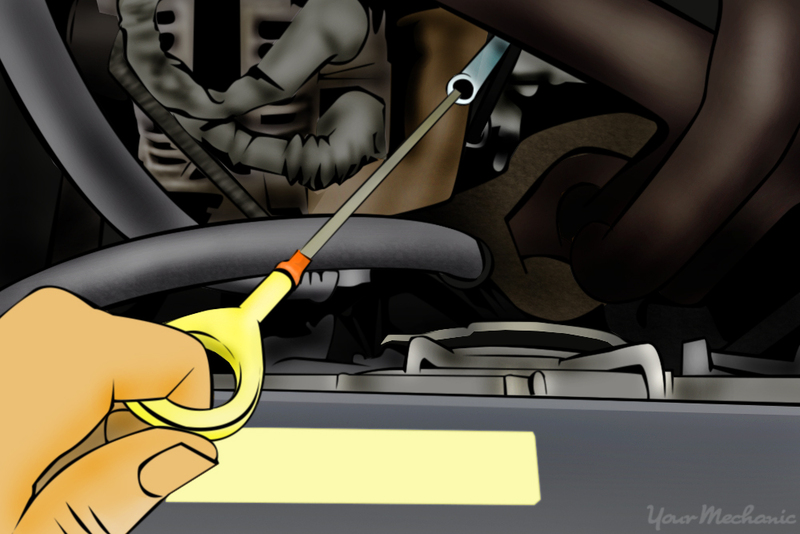 If you added oil so that the dipstick now shows an adequate oil level and the light is off, you can drive the car if engine is not making noise. At times, it may not be safe to drive your car at all. If the oil dipstick showed no oil at all, you shouldn’t drive your vehicle even if you add oil and the engine is noisy. Tip: Do not drive your car if the oil light doesn’t go off after adding oil. Some component in the oil system may be malfunctioning even if you have enough oil. Driving could cause further damage to your engine. Anytime one of your console lights comes on, it can be a scary moment, especially if you are not close to a service station or a mechanic. There are, however, practical measures you can take to preserve your engine and make the best of the situation. Be sure to have your vehicle inspected by one of YourMechanic’s mobile professionals as soon as possible. Q: My oil pressure gauge is reading zero.